After 5 days, the time came to leave New Delhi. Our guides had been preparing us for the 14 hour train ride to Bodh Gaya. But there is really no way to prepare one for this unique experience. It’s hard to describe. Let’s just say it’s a wild ride. Millions of people of all castes travel the trains daily throughout India. How this mass chaos works is beyond me. I’m just grateful we made our train. To get 30 pilgrims with too much luggage through the train station, onto the platform, and into the train is a huge feat. And we were late. In all the commotion, Michael gashed his leg which required a doctor and a tetanus shot. 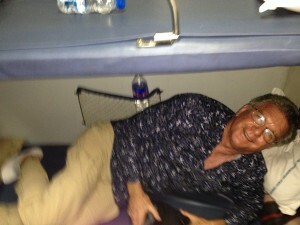 Alas, we made it on the train and into our sleeping compartment. Well, almost, Michael didn’t quite fit! When Michael told me that, as a surprise gift, he had signed us up for a 6 week pilgrimage to Bali and India, I was stunned. Mind you, the Bali part didn’t bother me. Two weeks in a garden paradise seemed right up my alley. But a month in India did not. I am, by nature, a compulsively neat, clean, and orderly personality. India just did not seem like a good fit for me. To put it mildly, I had a quite a bit of resistance to this part of the journey. But I was reminded, this is not a tourist trip, this is a pilgrimage. This is traveling for personal transformation – to bring something alive in oneself – something that can change one’s life. 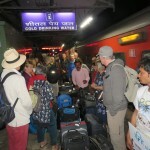 We arrived in Gaya at 4:30 am to a very crowded train station. Travelers, pilgrims, beggars and peddlers, everyone, including us, seemed to be hustling to go somewhere or get something, even at this early hour. It didn’t resemble much of what I expected from the center of the Buddhist world. 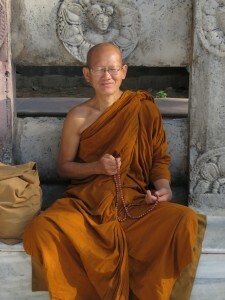 However, as all Buddhists know, expectations are the source of much of our suffering in life. My first step was to release all the expectations I had. Once one yields to a spiritual pilgrimage, you learn to open to the mystery and to what unfolds before you. You trust there is meaning and purpose to every stop on the road. Eventually, this dreaded journey into India was beginning to feel like exactly the right next step for me in my life. Intuitively, I began to know there was something big waiting here for me. Little did I know that I would find access to my own deeper wisdom just by being in this crowded, dirty, busy temple town. Little did I know, that like Buddha, sitting under the bodhi tree would bring me to a greater insight into my own sense of equanimity (ease), love for all things, and a state of mind that not only allows me to see the beauty in India, but in myself, in others, and in this crazy, crazy world. This is the buddha nature that is inherent in all of us if we wake up to it. You may ask, “How can this happen just by visiting a bunch of old temples?” This is exactly the question someone asked the Dalai Lama the last time he was in Bodh Gaya. His explanation was definitive that there is a real, palpable power in holy places. 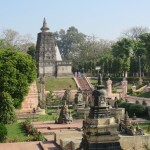 He said that in any holy place – Bodh Gaya, Jerusalem, Mecca, just to name a few examples – where many holy beings have taught, practiced, prayed and lived, these places take on the imprint of these experiences that can literally change the atmosphere and the energy of these physical sites. The Dalai Lama goes on to say that when someone comes with the intention to receive these deep, subtle vibrations, that one can actually feel them. You can literally sense something special and as pilgrims, being open to these experiences, one can gain clarity, insights, and deep sensations of peace, love, and wisdom. 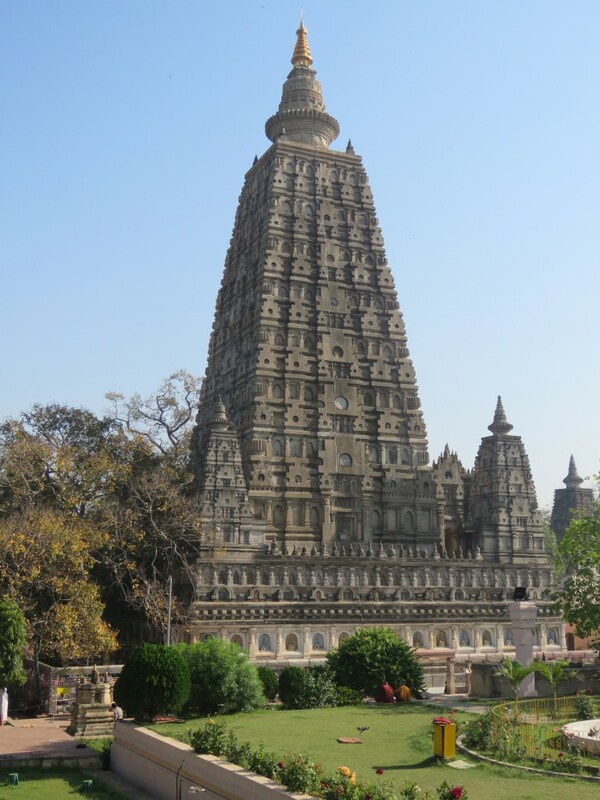 Little did I know, that just by coming to Bodh Gaya, I could feel such an awakening. On one of our daily visits to the Mahabodhi Temple, our teacher, Atum O’Kane, gave us the spiritual practice of looking for the Buddha in everyone we see. That day was magical. The grounds were filled with pilgrims from around the world. I could physically feel the love, joy, and caring that came from everyone I looked upon. Some people were in deep meditation. Some were doing the physical practice of prostrating themselves, standing and then going to the ground over and over for very long times. You could see the sweat and fatigue as they gave their physical body to worship. Others slowly walked the grounds looking at the flowers and the lake with deep communion and respect. 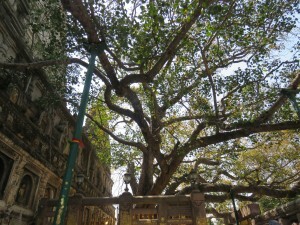 Some monks would playfully run to pick up a leaf that had fallen from the bodhi tree. They would laugh whether they got the leaf or not. Often the monk that captured the leaf would then give it away with a smile. We received a leaf from a monk and it made it very special. A small older female monk came up to me with a lei of orange flowers pointing to a Buddha statue that was on a high altar. 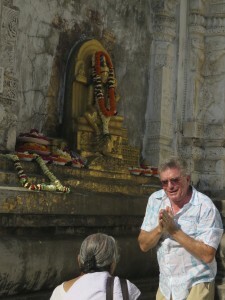 I reached as far as I could and managed to put it at the feet of Buddha. Pleased I turned back to her but she was shaking her head “No” and pointed to her neck. She wanted her flowers to go around Buddha’s neck. So I took the lei from Buddha’s feet and gave it my best toss. I missed. I gathered the lei and tried again. Success. I turned to the old woman and she gave me the best smile I’ve ever seen and with hands together a quiet “Namaste”. I smiled and greeted her back. It felt so good. When I turned to leave, an old monk that had been watching it all smiled and gave me a thumbs up. The entire time at the temple was a love fest with strangers from around the world. 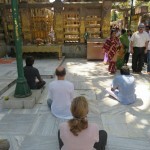 For Kathy and I both, the temple has been the highpoint of our trip in India so far. 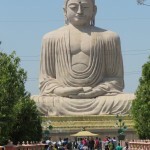 After a glorious time in Bodh Gaya, we boarded a bus for a 6 hour road trip. After we got off our air conditioned bus in the midday heat (100 degrees), we took a canoe ride across the holy Ganges River and arrived at our next destination – Varanasi – one of Hinduism’s seven sacred cities. 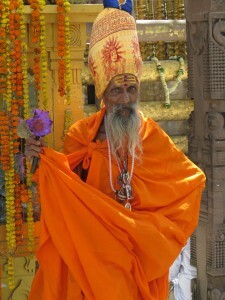 Look for our next post where we share our trip down the Ganges and into the alleys and temples of this old city. 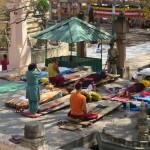 Here a few more photos from Bodh Gaya…scroll over for titles. Love hearing from people at home! This entry was posted on Saturday, March 28th, 2015 and is filed under Bodh Gaya, Buddhism, Dude Ranch, India, Journey, Meditation, Spiritual Journey, Travel blog, Uncategorized. I am excited to hear your experiences and see your deepening transformations. love you both! It will be curious to see how this new level of spirituality will work once you are back in America. 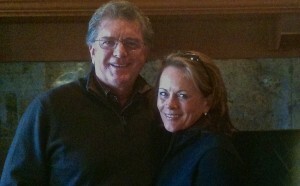 I think it’s great that, after what you have shared, you will have each other to fall back on should the feelings fade. However, I know you are both seekers and so will do your very best to keep living as though still on your pilgrimage. I’m sad that your trip is coming to a close and there won’t be many more chances to read about it (but for you, after 6 weeks, I know SLO will be a welcome place to come home to!). Thank you for sharing your journey. I am in awe of both of you. You literally embody Namaste. I love reading about your journey. You are both such wonderful writers – I feel like I am there with you. And the photos are amazing as well. I had been wondering whose idea this was to go on this pilgrimage and now I know … and I share Kathy’s mixed feelings of anxiety and curiosity and desire for spirituality. I’m so happy that you’re realizing the outcome you had hoped for.